You are here:Home » Category: "Dental Implants"
Dr. Antolak: Hi this is Dr. Antolak from thegentledentist.com. We’re in Shelby Township, Michigan. Our phone number’s 586-247-3500. And today we have a very special person, Dell. She’s agreed to record this and then I’m going to put this online. The reason why we want to do this is Dell’s had some really nice results so far. And what we did for Dell, is Dell was experiencing some problems. She had had some missing teeth. And where these missing teeth were she had an issue with where her sinuses actually dropped down. What I like to do is just to show you on an x-ray here her situation she had before. Right here this is the sinus cavity right in here on Dell. What we needed to do was we had to actually take this tooth here out because this was a bridge she had that was fixed and now the space we had between here and here was only a couple of millimeters, very, very thin. We actually had to do surgery and go in to the sinus cavity here and actually raise the sinus membrane. I have a little skull here that kind of shows what we did. We went in to the side of the bone here and we lift up that sinus cavity. Then we let that area heal and since we did that surgery you were saying that you’ve been feeling better tell us a little about that. Dental Patient: Yes, I feel much better. My sinuses seem to be much clearer than before. Very relaxing visit that I had. They sedated me so that I could not feel anything. I mean, I knew I could see the people. But I was very comfortable. And when you walk into this dentist’s office, if you’re an uptight person, you can walk in the door and be so comfortable that when you get to that dental chair, it’s just like a, it’s just something that you have to experience. It, it’s just wonderful. It’s wonderful. Everybody here, he’s got a great team. He’s got a great team. I highly recommend him. Dr. Antolak: What we did for Dell was we did that process and it’s taken some time for the healing to take place. And now today we’re going to actually take those implants that we placed in there and we are going to be restoring them. Basically it’s a situation like this. I just have a demo here and this is going to show where we would put what’s called an abutment in the one area implant and the abutment in the other one and we’re going to connect them together with one piece. A fixed bridge like that. So we can do that with implants where sometimes you don’t have any teeth at that point in time. What I like to do is to come over here again, and what I’ll do is I’ll show what we had done and kind of where things stand right now. During the surgery, this is what we’re looking at here. These are different parts of the process of doing the surgery. This is where she had a tooth here and she also had a missing tooth so see she had a big long span bridge here. So what we do is we save this tooth here and so she’s got an actual tooth here and now this x-ray here’s going to show the placement of one of the implants. If we look real closely right in here this is where the grafting was done. You can see it. It basically filled this area. And originally that sinus came down way down in here. We were able to put that implant in. and this is where all that grafting material is. And by lifting that sinus up, what that does, is it allows for drainage of your sinus cavity to not hang down in those really deep recesses of the sinus. But allows it to drain into an area that allows it to naturally do it before you’ve lost any teeth. Dental Patient: It’s, very true. What he is saying is very true because I, I would not have believed it until I have gone through it. And I’m excited to get my implants. Dr. Antolak: Get some teeth in your mouth so you can chew. Okay, we’ll show you part of that process. OK so right now this is the head of the implant here and over here behind us here is the head of the implant. In other words it’s the very top surface of the implant and we’re going to be putting the abutments in there. So it’s just poking through the tissue. The implant’s there and you can see this one better right here. I’m going to go ahead and just clean this up a little bit, and then we’ll show you how the implant goes on the abutment. OK so right now we went ahead and replaced these are the both the abutments these are the implants they were on. They actually just they go from here up the top of the implant sits about this level here and right now we’re going to put a temporary bridge over the top of it. But this is going to be her thing. These are the implants so they represent my teeth. We’re going to be a tooth here a tooth here a replacement tooth and tooth in the on here and it’ll suffice to hold her teeth. It’s nice and solid. Not going’ anywhere. And she’ll be able to use them like her own. Okay. So now this is uh, we made a temporary bridge on it. We took what’s called an impression. And I’ll show it to you in a second. What we did is, this is going to be her temporary right now. So there’s the implant sits underneath here. And underneath here. And it sits here, too. This is all 1 piece. And go ahead and bite down for me. And so she’ll be able to chew on this now for, since she hasn’t been able to chew on it for quite some time. As this heals and as the bone heals she’s going to find that it’s been something that has been. She’s going to get used to having something there to chew with and it’s going to be nice and strong for you, too. Okay. This is the impression we take. And this is uh, uh, rubber. And then the laboratory’s going to make one made out of all porcelain for this and it will be good and healthy for you. So you can go out and go with your friends now with your girlfriends and eat right? Dental Patient: Yeah let’s hope so. Dr. Antolak: Yeah so this is Dr. Antolak. Thank you for following us through this. We’ll see you in about three more weeks and we’ll put the final fix bridge in. It does not come out of the mouth, Dell wanted to make sure of that and you’re going to be able to function fine with this. So if you’re looking for a dental office where we are compassionate to your needs and also do quality dental care. Please give us a call. 586-247-3500 is our phone number in Shelby Township, Michigan and our website is thegentledentist.com. Thank you and have a blessed day. Hi this is Dr. Antolak from thegentledentist.com in Shelby Township, Michigan. I respond as “The Gentle Dentist” because of the fact that people may claim to be gentle but this is something we have proven in and out and our patients have really said a lot about that. That means even replacing dental implants to do the best we can to be as gentle as possible. What I want to do is to describe what a dental implant is, and show you how that works on a model. This is a model of what a patient’s mouth would look like and they have missing teeth. What I wanted to do is to show you that there’s been a dental implant that’s been placed in the artificial bone. But I do want to show you what an dental implant looks like and what this is about. So this is a dental implant, when we put it in the mouth we use it like this. So what happens is once a dental implant is placed in the mouth we can take a look. It’s made out of three different sections. One is the dental implant itself. And one contains what is called the abutment. This is the implant itself. This smaller part right here is called the abutment. That goes inside the dental implant which snaps inside, and there is a little screw for example in this one right here is a little screw that combines the two of them together.Once that’s placed in there that becomes what the dental implant would look like right there. For example when the dental implant is placed in the mouth in the jaw like this, we place the abutment like I’d just described into here. We actually screw that into the bone itself and what we do then is we actually torque it with a torque wrench. This is actually some of the instrumentation we might use. Obviously we sterilize the instruments before we do anything and they remain sterilized through treatment. What happens is these go on right over the top of it, in plain view we have the ability to put it on this and then when we torque it. We can see the bar move, and it will show us how much pressure to apply to put into that bone to make sure that it goes in with enough resistance so that it remains stable and we can have the bone grow into it. Once this is in place we basically cut this section right here in the green section. And that becomes what it would like after a dental crown would be done or a cap would be made. Then we can have a dental crown placed, an artificial dental crown placed over the top of that. And that ends up being your tooth that has been missing. So, that’s kind of an overview of how it works. Some of the instrumentation that we use are a really awesome way to replace missing teeth. Dental implants are really great for holding dentures down in place that have been loose. So we can place a dental implant, sometimes just a couple of them in the lower jaw here, and we use something that will actually snap over the top of that implant, and that will hold, hold those dentures nice and tight. So if this is a kind of way that you’re thinking about possibly replacing your missing teeth, this is what we can do is a dental implant. Thank you. If there’s any questions, you can call us at (546)247-3500. Thank you. This is Dr. Antolak from TheGentleDentist.com. We’re in Shelby Township in Macomb County. Our dental practice has been in its current location for around the last 7 years, and I’ve been also the writer of Ask the Gentle Dentist in the Advisor Source paper called The Senior Living News. One thing that I do write about a lot is about what implants are and this is a question people have a lot of times. What is the difference between a mini implant and a traditional size implant? What I wanted to do was to kind of show you what the difference is. I’m holding it in my hand right now. So, this is a mini implant here. I’m just going to show this to you here. It’s very small. It’s about less than 3 millimeters in width and as you can see right there and what it has is this part here goes into the jawbone and this part here is used to snap on a denture. And so this is the metal part inside the denture. It’s got a little snap on it, and that snap is what we can see here if you look at this picture here where we can see how this fits inside the jaw bone and then on the denture. There’s like a rubber O-ring and it allows the denture to be stamped over the top of that and to hold in place securely. The difference is, is that once we get into using the mini implant is basically used for holding in dentures. Okay? Because it has just one top on it we get into what’s called a traditional implant. They’re usually over 3 millimeters of width. And this is a traditional implant right here. This purple top right here, is the part that we used to place it in. Typically we’ll cut it off right here. And let me show you, right here. This is very small but this is a little screw that goes in. And then take it out and all of a sudden we can remove that. And this is what the implant looks like. The implant is usually. This one here is placed into the jawbone. It’s allowed to heal, and then we can then come in and we have many different parts that we can actually place over the top of this implant. For example in this example, this would be a single crown. Once this purple part is removed, and then this is called an abutment. This abutment gets screwed down on top over that, and then, if you can envision, this is similar to what a crown will be like on a tooth, mini implants, once again, are used for dentures basically. And, the traditional implant can be used for a single crown. To make what’s called a bridge where it’s a number of implants that are placed to replace a series of teeth. These are cemented in place so they do not come out. Also, it’s used for single crowns. And, so, when we get to a traditional implant because we can unscrew that top, it gives us a lot of accessibility to different types of procedures. If implants are something that you’re interested, we do a lot of implants here at this practice. We place them, and we also restore them. So being located in Macomb County, I’m sure we can satisfy your needs. We’re just minutes away, right on the border of Macomb County and in Shelby Township. Our phone numbers (586) 247-3500, and our website is TheGentleDentist.com. Thank you. 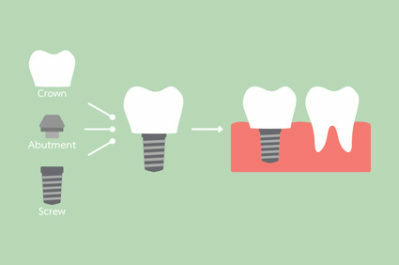 Implants are small “man-made” roots that are inserted into the jawbone. The bone grows into the implant and on top of the implant different structures can be made to replace teeth, hold dentures in place, or act as anchors for bridges. They are very successful (greater than 93%) long term as long as they are used and designed properly by the dentist. Typical implants are slightly smaller than the diameter of a drinking straw. There is more research being done in the implant field than any other field in dentistry and because of it many options are being made available. There is no waiting period for bone to grow into the implant therefore the results are instant. The cost is substantially less that the larger implant. It can be used on those patients who can’t have surgery because of health problems. There is little or no pain associated with the treatment. If the existing denture is in good condition it can be reused. If you have any further questions regarding implants, please give our Shelby Township office a call at 586-247-3500. Hi, I’m Dr. Antolak at thegentledentist.com. We’re in Shebly Township, Michigan, (586) 247-3500 is our phone number. What I’d like to do is talk to you a little bit about dental implants. Dental implants are an unbelievable way of preserving teeth, securing dentures, and a great way to help to give you something that you lost, namely your teeth. I’ve been personally placing dental implants for about the last nine or ten years. Dental implants are something I knew at that point in time something that was really valuable. Patients needed to have exposure to using them, and implementing them. So, what we did was place dental implants and restored them with crowns. We replace teeth that have been missing, lost, and if root canal teeth have failed. We take the tooth out, and put in a dental implant. Within the last few years, mini implants have really been taken on strong. As you can see, the picture I have here, you can see the difference in the size of a traditional implant, which is on the right hand side. And then, on the left hand side, a couple of smaller size implants; those are called mini-implants. Basically the definition of a mini-implant is three millimeters in diameter or smaller, and a standard implant is greater than three millimeters. So, you see on your left hand side, it is about five millimeters in diameter. The other two that you see, are three millimeters in diameter. You’ll notice that the tops of the ones that are three millimeters in diameter have a different attachment. So those can go into the jawbone. Depending on the case and the situation, dentures are made to have little snaps that go inside the dentures, and they snap over the top of either one of those two mini-implants. The benefit of the mini implant is that it’s more conservative. 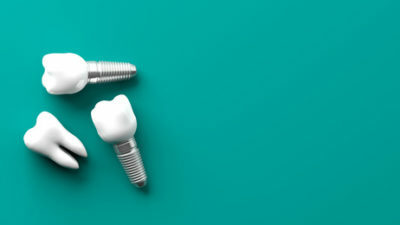 In other words, for patients who can’t afford the full size dental implant, or if they have more medical issues where they can’t actually go through more advanced surgeries, the mini implant is a great alternative. By having the mini-implant, it keeps lower dentures down secure into the jaw bone. It keeps it secure over the ridge so that the teeth don’t move around. One of the biggest problems with lower dentures especially is that they move around a lot. You can never bite down predictably with a full denture. So these mini implants being there allow you to bite down with confidence. You’re going be able to bite down a lot harder and therefore chew the foods you want to chew, not the foods you actually have to eat like the soft foods or the mushy foods. We can also do the same thing and put them on the upper dentures too, so either way they work great. If you’re interested in having some kind of an implant to either help support your denture or missing tooth, please give us a call. Our phone # is (586) 247-3500 and our website is thegentledentist.com. Thank you, and have a blessed day.